As the name implies, stakeholders hold a stake in the organization, its processes, and its business outcomes. That’s why you need to embrace positive stakeholder relations to achieve desired results. Without the active, willing involvement of stakeholders, you can’t get to your endgame. What defines a stakeholder? He or she is anyone who is affected by your work, has influence or control over the process, or relies on the outcome. Stakeholders encompass every member of the value chain, including coworkers; your boss; suppliers; advisors; support staff; and, most of all, customers. 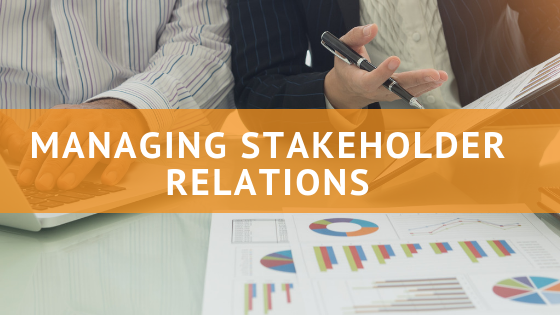 As part of stakeholder relations, you have to start by identifying the stakeholders and determining their level of interest, and their motivation, in the success of your operation. Primary stakeholders: These are people directly affected by business processes or any changes in procedure or strategy. Customers are usually considered primary stakeholders, as is everyone else directly involved with meeting the needs of the customers. Secondary stakeholders: These are people indirectly affected by changes, such as those involved in business operations or customer support, or who have an indirect impact on project outcomes. Key stakeholders: This final group can include people such as investors or shareholders who have a vested interest in the company’s success. Each of these stakeholders has a different motivation and is seeking a different outcome. Primary stakeholders, for example, are concerned with customer satisfaction and ensuring that the sales and fulfillment process goes smoothly. Secondary stakeholders may be involved in post-sales support, such as billing or training. Key stakeholders are going to be concerned with the overall success and profitability of the company. Understanding the motivation of each group is the first step in successful stakeholder relations. Once you have identified your stakeholders, you need to prioritize them. Identify who is going to be directly affected by business activities and changes in policies and procedures. Do they have the power to block or modify your goals? Do they influence outcomes? Who is most important to you? The secret to positive stakeholder relations is good communication. This means not only providing information but also listening closely. Start with transparency. Be sure each stakeholder understands the who, the what, the when, the where, and especially the why of projects or processes. Explain how any change or implementation is designed to promote the best outcome. When possible, be sure to tailor your explanation to address each stakeholder’s motivations. Remember that stakeholders need to be inspired, not told. By being part of the value chain, each stakeholder has an influence as well as an interest in outcomes. That’s why you want to promote collaboration. Through proper communication and explanation, you can not only break down barriers but also give stakeholders a sense of ownership since they understand where they fit in the big picture. Another part of effective communication is soliciting feedback. You should listen first. Determine what motivates each stakeholder. You should be able to identify different objectives and desires, which will make it easier to strike compromises that will satisfy everyone. When soliciting feedback, be sure to make each stakeholder feel that his or her opinion matters, whether you are meeting with your team or surveying customers. Whenever possible, schedule one-on-one meetings to exchange points of view. It’s easier to build consensus when you don’t have to convince a room full of people. Meeting face to face makes it easier to establish a rapport and build alliances. As part of your communication strategy, learn as much as you can about stakeholder motivations. Ask about their pressing business needs, what information or details they need, who or what influences their decision-making, and what they hope to see as an outcome. Rather than guessing at motivations, it’s easier to ask, which helps keep lines of communication open. If you can identify and meet the needs of your stakeholders, you can move forward with fewer obstacles. However, you first have to invest the time and effort into stakeholder relations, communicating with each group, learning more about the stakeholders’ goals and expectations, and understanding their motivations. Your goal is to build consensus so you can establish common objectives for 2019 that everyone wants to achieve.